There is no aspect of creationism which is under greater attack by evolutionists than the biblical doctrine of recent creation. The evolutionist, knowing the weakness of the scientific case for evolution, almost always directs his own argument not against creation per se, but against recent creation and flood geology. As a result, many people who consider themselves creationists have been intimidated against this biblical concept. Instead, they try to cling to the nineteenth century evolutionary compromises now known as the ‘day-age’ theory and ‘progressive creation’. Some take refuge in the ‘gap’ theory, hoping they can ignore the problem by pigeonholing the evolutionary ages of the geologists in an imaginary gap between the first two verses of Genesis. These theories attempt to accommodate the geological ages, even though it is the geological ages which provide the main basis and framework for evolution. We ‘young-earth’ creationists are an embarrassment to both the progressive creationists and the ‘gap’ creationists, so they urge us to acknowledge that recent creation is merely an optional interpretation which is unimportant and expendable. But this we cannot do. As a strictly scientific question, divorced from any biblical or theological considerations (as presumably, in a school textbook or in a scientific debate) the date of creation can and should be treated as a separate topic from the fact of creation. This does not make it expendable, however. It is an important and basic issue that deserves serious study in its own right, strictly in terms of the relevant scientific data. When the biblical and theological data are also considered (as in a church or other Christian context), the doctrine of recent creation becomes critically significant, integrally interwoven with the doctrine of creation itself. Outlined below, very briefly, are a few of the reasons why the doctrine of recent creation is vitally important to true biblical Christianity. ‘Progressive creationism’ is not a modern interpretation developed to bring the Genesis record into harmony with modern science. It is a very ancient concept devised to impose a theistic connotation upon the almost universal pagan evolutionary philosophies of antiquity. The primeval existence of the cosmos, with matter in some form present from eternity, was a dogma common to all ancient religions and philosophies, seeking as they were to function without an omnipotent, holy, eternal, personal Creator God. Compromising monotheists, both in ancient Israel and in the early Christian church, repeatedly resorted to various allegorical interpretations of Scripture, involving some form of protracted creation, seeking to amalgamate creationist/redemptionist theology with pagan humanistic philosophy. Almost inevitably, however, such compromises ended in complete apostasy on the part of the compromisers. In more modern times, Charles Darwin himself is a classic case. Starting out as a biblical creationist, his decline began with the acceptance of Lyellian uniformitarianism, the geological ages, and progressive creationism. He then soon became a full-fledged theistic evolutionist and eventually an atheist. The same steps were travelled by many other scientists of that period. In fact, science itself was originally committed to the strict biblical chronology (in the days of Newton and the other founders of modern science), then drifted into progressive creationism (after Cuvier, Lyell and others), then into a Darwinian theistic evolutionism, and finally into total evolutionary naturalism. Even if one does not accept the Bible as the inerrant Word of God, the concept of a personal, all-powerful, all-knowing, loving God is fatally flawed by the old-earth dogma. Surely an omniscient God could devise a better process of creation than the random, wasteful, inefficient trial-and-error charade of the so-called geological ages, and certainly a loving merciful God would never be guilty of a creative process that would involve the suffering and death of multitudes of innocent animals, in the process of arriving at man millions of years later. It should be obvious that the God of the Bible would create everything complete and good right from the start. The wastefulness and randomness and cruelty which now are so evident in the world (both in the groaning creation of the present and in the fossilized world of the past) must represent an intrusion into His creation, not a mechanism for its accomplishment. God would never do a thing like that, except in judgment of sin! Furthermore, if one must make a choice between a full-fledged theistic evolutionism and a compromising ‘progressive creationism’, with its ‘day-age’ theory of Genesis, one would have to judge the latter worse than the former, theologically speaking. Both systems are equally objectionable in terms of their common commitment to the geological-age system, with its supposed three-billion-year spectacle of random wastefulness and a suffering, dying world. However, progressive creationism compounds the offence by having God redirect and recharge everything at intervals. Theistic evolution at least postulates a God able to plan and energize the total ‘creation’ process right at the start. Progressive creation postulates a world that has to be pumped up with new spurts of creative energy and guidance whenever the previous injection runs down or misdirects. Those who really believe in the God of the Bible should see that any compromise with the geological-age system is theological chaos. Whether the compromise involves the ‘day-age’ theory or the ‘gap’ theory, the very concept of the geological ages implies divine confusion and cruelty, and the God of the Bible could not have been involved in such a thing as that at all. As far as the biblical record itself is concerned, there is not the slightest indication anywhere in Scripture that the earth endured long ages before the creation of Adam and Eve. The Lord Jesus Christ Himself said: ‘But from the beginning of the creation God made them male and female’ (Mark 10:6). ‘Remember the sabbath day, to keep it holy. Six days shall thou labour, and do all thy work: But the seventh day is the sabbath of the Lord thy God: in it thou shalt not do any work … For in six days the Lord made heaven and earth, the sea, and all that in them is, and rested the seventh day: wherefore the Lord blessed the sabbath day, and hallowed it’ (Exodus 20:8–11). ‘It [the sabbath] is a sign between me and the children of Israel for ever: for in six days the Lord made heaven and earth, and on the seventh day He rested, and was refreshed. And He gave unto Moses, when He had made an end of communing with him upon Mount Sinai, two tables of testimony, tables of stone, written with the finger of God’ (Exodus 31:17, 18). All Scripture is divinely inspired, but this portion was divinely inscribed! Still further, the record of the six days of creation concludes with the statement by God that everything in His creation was ‘very good’ at the end of the six days (Genesis 1:31). There is no way this could be harmonized with a worldwide fossil graveyard a mile deep all around the earth. The Bible makes it plain, in fact, that death didn’t even enter the world until Adam sinned (Romans 5:12; 1 Corinthians 15:21) and brought God’s curse on the ground (Genesis 3:17; Romans 8:20–22). But it is really the other way around. If the earth were old, God would not deceive us by saying so clearly and emphatically that He created it all in six days. For that matter, the earth does not really look old anyway. Evolutionists have tried to make it look old by imposing the unscriptural and unscientific dogma of uniformitarianism on the geological record of earth history as preserved in the rocks of the earth’s crust. The fact is that geologists are today finally abandoning their outmoded nineteenth century uniformitarianism, realizing that catastrophism provides the only realistic explanation for the great geological structures of the earth. Even though they are still unwilling to acknowledge the validity of flood geology as based on the Bible, they do recognize now that the earth’s various geological features were each formed rapidly, in intense catastrophes of one kind or another. Furthermore, there are many times more geological processes and systems2 that yield a young age for the earth than the handful of radiometric methods that can be forced (through an extreme application of uniformitarianism) to yield an old age. The continued insistence on an ancient earth is purely because of the philosophic necessity to justify evolution and the pantheistic religion of eternal matter. If it were not for the continued apathetic and compromising attitudes of Christian theologians and other intellectuals on this vital doctrine of recent creation, evolutionary humanism would long since have been exposed and defeated. The world will never take very seriously the biblical doctrine of the divine control and imminent consummation of all things until we ourselves take seriously the biblical doctrine of the recent creation of all things. Neither in space nor in time is our great God of creation and consummation ‘very far from every one of us’ (Acts 17:27). Henry Morris, Ph.D., is president of the Institute for Creation Research in San Diego, California. He served for 28 years on the faculties of major universities, including 13 years as chairman of the Civil Engineering Department at the Virginia Polytechnic Institute and State University. Return to top. For a fuller account, see Henry M. Morris, History of Modern Creationism, Master Books, San Diego, 1984. See Henry M. Morris and Gary E. Parker, What is Creation Science? 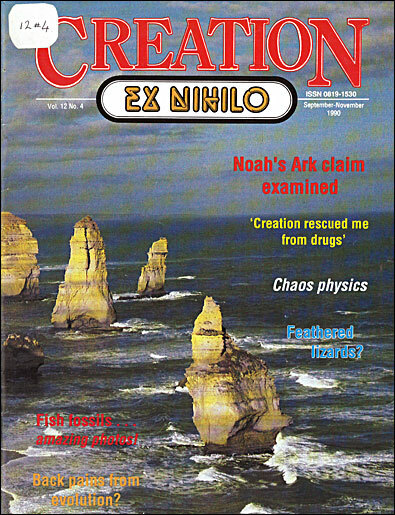 Creation-Life Publishers, San Diego, pp. 239–259, 1982, for a listing of more than 60 such processes.